PRINT YOUR OWN LEARNING GUIDES, OR UPLOAD GUIDE TO YOUR INTRANET … AND SAVE! Customers who have purchased an INFORM video training program should make available copies of the associated Learning Guide to reinforce the training process and for subsequent reference. If you expect you will be training numerous employees, you may be interested in buying the PDF version of our Learning Guide so you can print your own copies or have it available on your internal training system. Depending on the quantities you will need, this may be a lower cost alternative for you. While the basic price for a Learning Guide is $10.00 each, with increasing discounts as more copies are purchased, the price for a PDF master is only $99.00. This makes uploading the Learning Guide to your intranet, or printing your own copies in larger quantities a viable option. The authority to print your own Learning Guides, or upload it to an internal intranet service, using this master PDF remains yours for as long as you make use of our video. TERMS: Your purchase of this PDF, however, must be accompanied by your agreement that the PDF and any copies made of our Learning Guide (digital or printed) will be for internal use only and will not be resold or exported — it will be solely for the use of employees within your company. It must not be made available to anyone outside of your company. The PDF copy of this Learning Guide will be sent to you by e-mail once we receive your order. 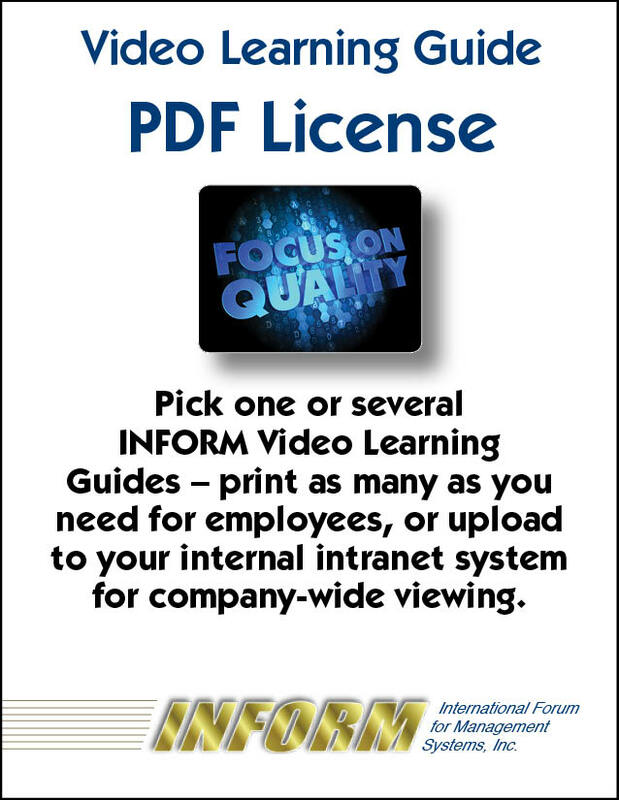 LEARNING GUIDE LICENSE AGREEMENT: This license authorizes your organization to print as many copies of the INFORM Learning Guide as you need for your employees, or for uploading the Guide to your local intranet for internal viewing. Your organization agrees by paying this invoice to not export the Learning Guide, sell copies, or use it for the benefit of people external to your organization – in any format. Upon receipt of your payment, INFORM will send you a PDF version of the Learning Guide. License is effective immediately upon receipt of fee and there is no expiration date to its application. THERE IS NO GUARANTEE OF SATISFACTION ONCE PDF HAS BEEN TRANSFERRED TO CUSTOMER. If you have a question regarding the appropriateness of Learning Guide, please order a paper copy to review before you order the PDF copy. If Learning Guide meets your needs, you can then order the license/PDF version with confidence.